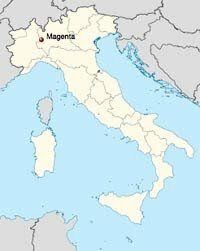 We can thank Magenta, Italy, a quiet town outside Milan, for the name of the color that isn’t really any color at all, but a trick of the eyes. And, actually, it’s probably the French not the Italians we should be thanking. To be honest, it’s all a little confusing, but we’ll try to sort it out! First, let’s take a look at the event that catapulted Magenta into infamy: The Battle of Magenta, fought on the outskirts of the town during the Second Italian War of Independence. Some historians say the Battle of Magenta was a turning point in the war. That’s all well and good, of course – but how did the color magenta get its name from this battle, what do the French have to do with it, and what was that about it not being a color at all? As it turns out, the town of Magenta, and the eponymous battle was fought the same year that a synthetic aniline dye called fuchsine was invented. In fact, it was the first synthetic dye ever made – prior to this, all dyes had come from natural sources such as plants, animals and minerals. But as handmade rugs from the East gained popularity, the need for cheaper dyes that could be produced easily became a priority. Want to learn even more, visit Sensational Color’s full write-up at http://ht.ly/3gxZR.